I meet people all the time who are looking for the best way to power their travel trailers. There’s a lot of solutions out there and I’m excited about one of the newest and best products on the market. The 120 Watt Portable Solar Kit is an easy solution to powering your travel trailer, RV, and fifth wheel camper. We also have an 80 Watt and a new 40 Watt coming out in August 2013. The reason the 120 is so great is because it’s graded for travel trailers and RVs, and it’s very mobile with extension cables and anderson clips. You can park in the shade and get power from your 120 Watt Portable Kit in the sun! Solar doesn't charge batteries in the shade. Recently, I talked with Dr. Pilmer who was frustrated with his existing roof mounted solar panel. He liked parking in a barn where his trailer is out of the sun, but couldn't charge his batteries while there. I told him not to worry, because he could tie this 120 Watt Portable Kit into his existing solar setup. He could place this solar panel in the sun while he was parked in the shade a few feet away. The 120 Watt even comes with a built in solar controller for singular use. These kits are less than you’d think, too, because they’re state of the art and brand new Go Power has released them for less than the mounted roof kits. That’s a great deal anyone can afford! Plus, these 120 Watt Portable Solar Kits are the top solar kits on the market today! 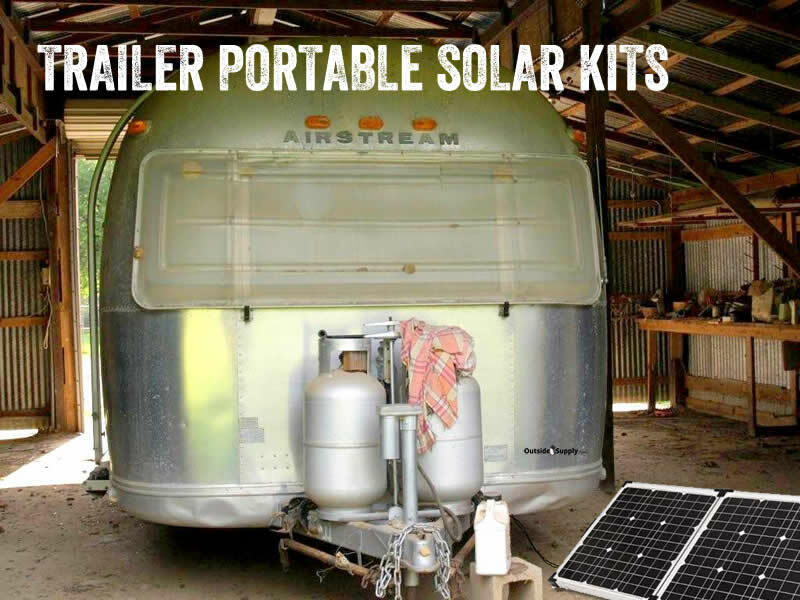 We at Outside Supply have been selling solar kits for the past decade, and we’ve never seen Portable Kits like these that are rated for travel trailers and RVs and built so durable and mobile. They even come with adjustable legs. They stow very easily in storage compartments in travel trailers. You’re getting 6.7 Amps of Current with a Built in 10 Amp Controller mounted under the solar module. It folds, opens and closes easily and zips up into the nylon bag. Dr. Pilmer was very happy with his purchase and kept in touch with us! We’re excited about these Portable Kits, and we hope you are too! For more information check out our RV Solar Guide Page!